Birthplace: Flushing, New York, U.S.
Jon Favreau is an American actor, comedian and director. He is also the founder of the Fairview Entertainment production company. Films (actor): "Rudy", "Very Bad Things", "Chef". Films (director): "Iron Man", "Iron Man 2", "Chef", "The Jungle Book". He has been nominated for a Primetime Emmy Award and he has won a Tribeca Film Festival Award. He is of Jewish, Canadian and Italian descent. He is married to Joya Tillem and they have 3 children together. Actor Robert Downey Jr is one of his best friends. Actor and film director Jon Favreau promoting the film "Iron Man" in Mexico City. 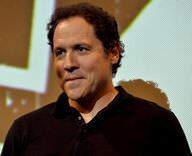 Jon Favreau is a famous American actor, comedian and director, who was born on October 19, 1966. As a person born on this date, Jon Favreau is listed in our database as the 4th most popular celebrity for the day (October 19) and the 32nd most popular for the year (1966). People born on October 19 fall under the Zodiac sign of Libra, the Scales. Jon Favreau is the 200th most popular Libra. Aside from information specific to Jon Favreau's birthday, Jon Favreau is the 1405th most famous American and ranks 3rd in famous people born in Flushing, New York, U.S. In general, Jon Favreau ranks as the 2458th most popular famous person, and the 514th most popular actor of all time. “The Famous Birthdays” catalogs over 25,000 famous people, everyone from actors to singers to scientists to serial killers and more. If you're curious to see who was born on your birthday, you can use our database to find out who, what, where, when and why. You can search by birthday, birthplace, claim to fame or any other information by typing in the search box, or simply browse our site by selecting the month, the day, the horoscope, or any other clickable option. 3rd born in Flushing, New York, U.S.